Celebrate friendship in style with our ruffled, alabaster-white, handmade ceramic Amici plate that bears in flowing cursive the prettiest word in Italian—Amici, or friendship. Just a few miles outside Salerno, on the shores of the Tyrrhenian Sea, lies the small town of Vietri sul Mare, where for centuries master craftsmen have made a light yet strong ceramic out of the locally available high-quality clay. Our handcrafted Amici Plate captures all the whimsy and joy of sunny southern Italy. The scallop-motif rim animates the oval dish and makes one think about all the positives we associate with circular things: the family circle, one’s circle of friends, the cycle of the seasons. 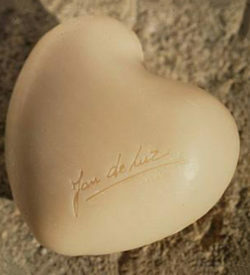 Perfect as a housewarming gift, party favor, or as an elegant soap dish for your guest bathroom.